The Form Gallery, Issue #069 - "Shepherdbase December 2013 Update"
I pray everyone had a Blessed & Merry Christmas! This issue is short because it is just for Shepherdbase customers. I will be sending out another newsletter next Monday. If you purchased Shepherdbase before December 11, 2013 then read below for instructions on how to receive your Shepherdbase December 2013 Update free of charge. If you purchased after December 11, 2013 then you have the updated current version of Shepherdbase. I have some good news though, I did also update the Weekly Contributions report and added the first names and envelope numbers. 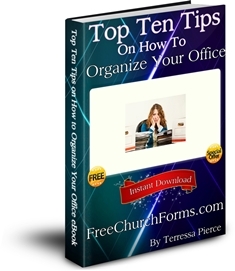 To receive this update I need everyone to contact me at terressa@freechurchforms.com and give me the month and year you purchased Shepherdbase and I will immediately send you the current updated version of Shepherdbase free of charge via email with no questions asked. You need to contact me soon because you will want to begin your new year (2014) with the updated version of Shepherdbase. If you don’t want to re-enter all your member’s personal information again then you can click the link below to download instructions to import your data from your current Shepherdbase into the updated new Shepherdbase version. Have a Blessed & Happy New Year!